The compact tripod that doesn't sacrifice on flexibility. The 190XPRO3 has a cleverly designed 90 degrees centre column mechanism, housed in the top coasting, so you can shoot more flexibly than ever. This enables you to quickly change the column to vertical or horizontal operation, meaning you won't have to spend time reassembling your equipment and missing that all-important split-second shot. 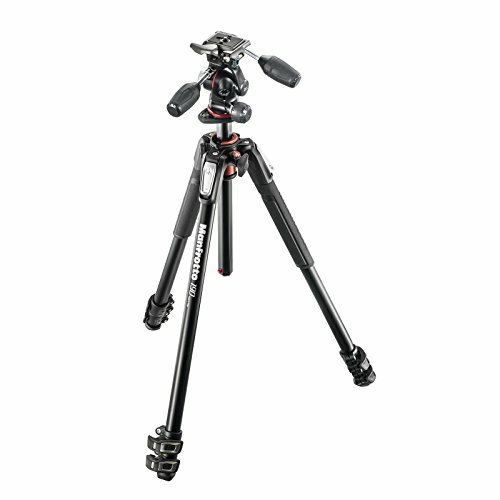 The 190XPRO3 tripod with head can also be extended and adjusted quickly, and this is all thanks to the Quick Power Lock levers. These block and unblock each leg section and allow them to be opened single-handedly in a single movement. They are significantly more rigid and stable than traditional designs, and with ergonomic and intuitive leg angle selectors, each leg can be independently set to a pre-set angle. That means you'll enjoy even more positioning freedom. The built-in bubble level allows you to frame more precisely thanks to its freely rotating mechanism. This prevents the level from obscuring your view, meaning nothing will get in the way of your shooting. With a quick-release camera plate, you can use this tripod with a wide variety of devices. New friction controls on the tilt and portrait axes also ensure the weight of your camera equipment is evenly distributed and completely secure. The tripod's retractable levers also make the XPRO-3-Way-Head ultra-compact, and you can easily make fine-framing adjustments with the locking knobs open before securing them when you're ready to shoot. Use the 190XPRO3's Easy Link connector to add a photo or video accessory such as an LED light or flash, all via an extending arm/bracket. Now you can make your tripod a practical mobile studio. The 190XPR3 is manufactured in Italy by Manfrotto.